The 26-County Taoiseach Enda Kenny has said he will raise Marian Price’s plight in Maghaberry prison when he meets the British Prime Minister David Cameron early next month. Mr Kenny said he would study the report of the all-party delegation from the Dublin parliament that had visited the prison and met and spoke to the veteran republican, who remains interned without trial. “I am aware of the circumstances of Ms Price going back into Maghaberry and of the medical reports regarding her state of health,” the Taoiseach added. In May 2011, Marian Price was arrested after she held up a piece of paper on a windy day, at a traditional Easter commemoration from which a masked man read. She was taken to Maghaberry high security prison (an all-male prison) and was placed in solitary confinement, where Marian was accused of, ‘encouraging support for an illegal organisation’. Marian has now been in prison for 16 months, during which time neither her lawyers or Marian have been allowed to see any of Britain’s ‘alleged’ evidence. Despite having been previously force-fed 400 times by the British in an English prison and in considerable ill health and pain, she was initially kept in solitary confinement in a ‘male’ high security prison, before her deteriorating health required her to be hospitalised. Although her release has been ordered on two occasions by judges, she remains interned without a trial, sentence, or release date by British decree. 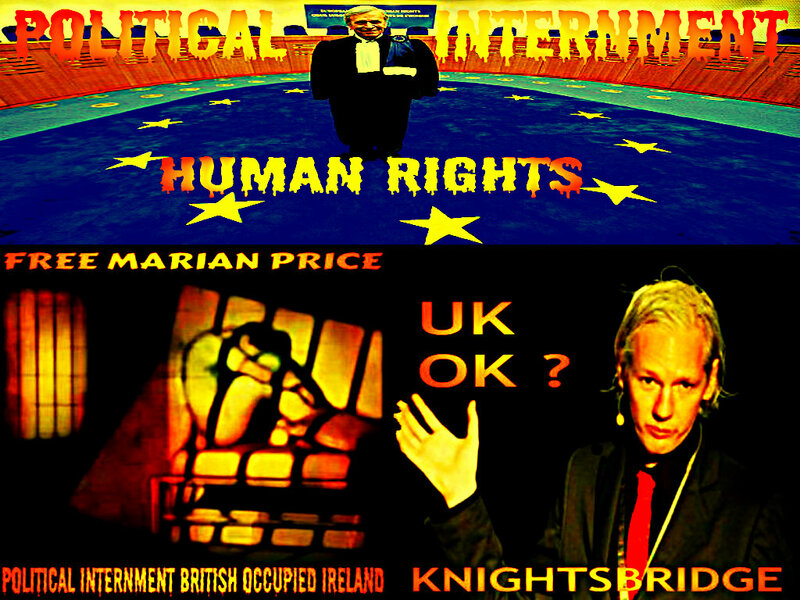 Two British Direct Rulers have claimed Marian’s prison release license was “revoked” -- even though she was never released on license. Last month, she was refused permission to attend her sister’s funeral. Sinn Féin leader Gerry Adams said a major issue surrounded her continued imprisonment and that of another veteran republican, Martin Corey. “They are held without charge or trial,” he said. “There is no due process whatsoever.”He said a delegation from the Dail had found Marian to be very ill.
“Obviously, she is also grieving for her sister, Dolours, who died just a short time ago. She is confined. The government needs to raise these issues. The Taoiseach replied that he would raise it with the British Prime Minister and that it ‘is not easy to decide what is the best thing to do’. 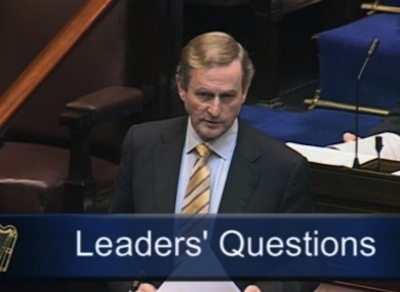 Responding, Gerry Adams said it was “straightforward”. “If a citizen is to be accused of an offence, that citizen should be brought forward and subjected to due process - sin e,” he said. “Ms Marian Price has not been subjected to due process. Whatever has been said against her has been said in secret -- she cannot even hear it. It is back to the old days of internment, commissions and all the rest of it. BANNERMeanwhile, republican activists in Belfast this week erected a banner on the Belfast motorway to mark Marian Price’s internment, now almost two years old. The 32 County Sovereignty Movement in Belfast said the banner was to mark that she has been interned 650 days “on the say-so” of the British government. 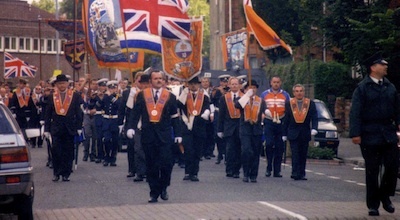 However, the body has become increasingly irrelevant in recent years as marchers and the PSNI police have routinely ignored their rulings.The issue became undeniable last month when loyalists protesting against a change in Belfast City Hall’s policy on flying the British flag were allowed to hold over a hundred marches without even informing the Commission. The PSNI police combined with loyalists to force the postponement of a key Belfast soccer match last weekend. 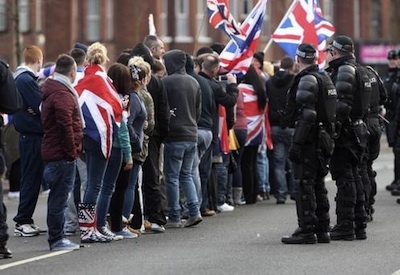 Loyalist protestors draped in Union Jack flags briefly clashed with the PSNI outside Crusaders’ home ground, Seaview, in north Belfast, before the match against Cliftonville was called off. Among those involved was notorious hardline loyalist Willie Frazer, while leading UVF paramilitaries form east Belfast were also observed to be in attendance.A DUP statement said one of the party’s councillors had been struck by the PSNI amid the disorder. It blamed Cliftonville fans (who are generally from the nationalist community) for “behaving badly and offensively towards local residents”. The PSNI said they asked the loyalists to move after 40 minutes, to allow fans to enter the stadium. “Despite intensive efforts by police and football officials to negotiate a peaceful outcome, the protest did not move and as a consequence police had to move the protest to ensure the safety of fans and allow the match to proceed,” a statement read. But the PSNI was accused of weakness in allowing the small band of embittered loyalists to disrupt an important sporting fixture.Both clubs had made it clear that they wished to proceed, and both sets of supporters -- normally associated with different communities -- had mingled together in a spontaneous act of solidarity. Sinn Féin’s Caral Ni Chuilin said it was “particularly disappointing” that the game had been called off “for reasons totally unconnected with sport”. “The flag protest which forced the cancellation of this match has nothing to do with football,” she said. Disturbances also closed the M3 motorway for more than an hour on the same day following the weekly loyalist march to Belfast City Hall. It was the 11th consecutive Saturday on which a flags rally had taken place at the city council headquarters. Protesters again paraded there from east Belfast and back again afterwards, without the permission of the Parades Commission. Addressing the crowd of around 200 -- down from 2000 at its height -- protest leader Jamie Bryson said he would “borrow a phrase” from Sinn Féin president Gerry Adams. “For 11 weeks people have tried everything to destroy these protests but there’s still hundreds of people standing here,” he said. “They have not won. We are not defeated. Adolf Hitler had a million followers. Jesus only had 12. GARVAGH ‘SHAME’Other loyalist protests across the north saw violence in Garvagh, County Derry, where a demonstration was described as “a night of shame”. A brick was thrown at a nurse’s car as she drove to work through the village on Friday night. Sinn Féin assembly member Cathal O hOisin called for more to be done to protect the public. “While I recognise the right to peaceful protest it is clear that many of these flag protests have been illegal or had violence and intimidation associated with them,” he said. SDLP Assembly member John Dallat said the demonstration was “an affront to humanity”. “These so-called protesters had their faces covered either with scarves or hoods, making it impossible to identify who they were, and that raises serious questions as to the legality of these so-called flag protests,” he said. More than four in ten children in West Belfast are living in poverty, it has emerged. New figures show that the constituency, in which 43 per cent of the children live in poverty, suffers from deeper poverty than any local authority area in Ireland or Britain, except for one ghetto in central Manchester. Children in other nationalist areas are also faring badly. 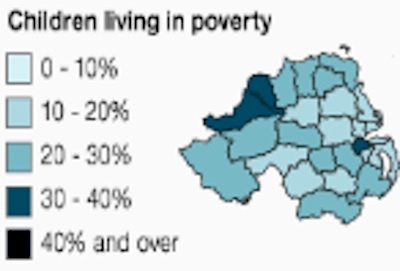 Although heavily promoted as this year’s ‘UK City of Culture’, Derry is now the fourth most poverty-stricken area for children under British jurisdiction, across either Ireland or Britain.Nearby Strabane, County Tyrone is another of the most deprived areas. However, figures for wealthy, unionist areas such as Lagan Valley and North Down have as little as 13% of children living in need. Commenting on the figures, Enver Solomon, Chair of the End Child Poverty campaign said the child poverty map reveals the “gross levels of inequality that children face in every region”. He said the huge disparities that exist have become more entrenched and are now an enduring reality, as many more children are set to become trapped in long-term poverty and disadvantage. Leading children’s charity Barnardo’s called on the Stormont administration to do something. “Behind today’s statistics sit the most vulnerable children in society, whose life chances risk being compromised by our failure to tackle child poverty effectively,” said Lynda Wilson of Barnardo’s. Nationalist politicians did not blame the poverty figures on continuing discrimination against their community, but described the statistics as a “scandal”. SDLP councillor Tim Attwood expressed shock at the statistics for his constituency. Sinn Féin’s MP for the west of the city, Paul Maskey, blamed the poverty on past neglect by the British government. “Low wages, as well as high unemployment, are contributing to the poverty faced by entire communities in west Belfast due to generational neglect by successive British governments,” he said. JUDICIAL REVIEWOngoing discrimation against Catholics was raised in the High Court this week, where the unionist management of the Girdwood housing project was called into question. For decades, nationalists have complained that unionist politicians have marginalised and ghettoised Catholics, while encouraging the development and expansion of wealthy Protestant communities. The sprawling new development, on the site of a former British Army base in north Belfast, is to be the subject of a judicial review after a judge accepted concerns over discrimination in the planning of the project.In court, Barry Macdonald QC pointed out that the DUP Minister Nelson McCausland and party colleague Nigel Dodds had acted in a sectarian manner. 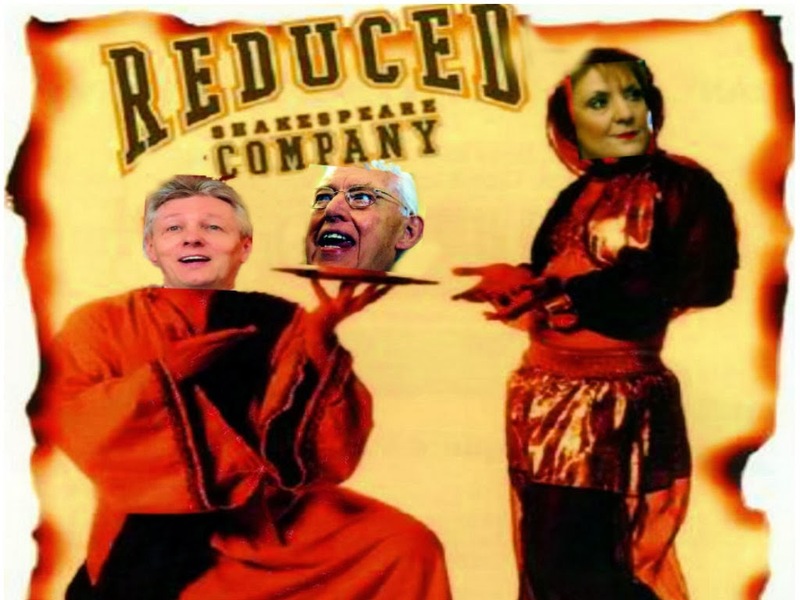 They were “grinning like Cheshire cats” in the publicity photographs for Girdwood, he said. “There is an abundance of evidence giving rise to a reasonable inference that Mr McCausland was indeed motivated by sectarian considerations. Irish community activists in Britain have sought high-level political discussions following an increase in attacks on Irish events by far-right organisations and loyalists. On Monday, Cairde na hEireann Liverpool met with that city’s Mayor and senior officials to ask that the rights of the Irish community to hold lawful, dignified and peaceful public events be upheld and protected. And this week in Wakefield, a small town in west Yorkshire made famous by the hunger strike of Irish martyr Frank Stagg, a dignified republican commemoration was beset a small group of flag-wielding loyalists, with little protection from the Yorkshire police.Similar problems have been encountered by Irish events and organisations across England and Scotland. But it is Liverpool’s Irish community which has been particularly targeted by right-wing British extremists, through openly racist and intimidatory confrontations. In a statement, Cairde na hEireann Liverpool said on Monday the attacks had been “an attempt drive the Irish community off the streets of Liverpool. The details of the attacks were published in a recent report by the community group, which has a proud history of involvement in the local anti-racist and anti-fascist struggle. 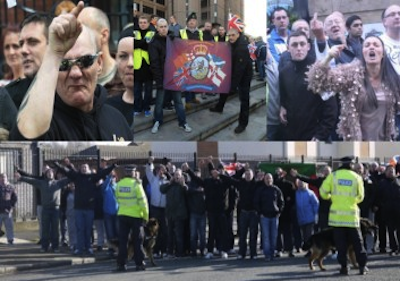 The report, ‘Under Pressure’, provides an account of recent anti-Irish racism in Liverpool, linking it to a history of institutional racism and far-right and Loyalist activity in the city.Last July saw a so-called “anti-IRA” march in Liverpool by hardline English Defence League splinter group the North West Infidels (NWI), a far-right street protest movement. It was planned in response to a march organised by the left-wing James Larkin Society to counter the rise in far-right activity targeting Muslims, trade unionists and Irish republican groups living in the north of England. The event had nothing to do with the IRA. And this time last year, in scenes unseen since the 80s, hardline British nationalists stopped a march commemorating Liverpool-born Republican Sean Phelan and racially abused marchers. It is feared the same scenes could be repeated in upcoming events. A number of news publications have also documented the increased links between loyalists and far-right racist groups such as the North West Infidels, Combined Ex-forces, English Defence League and the National Front. The rhetoric of groups like the English Defence League uses the recycled racism of the 1980s when the National Front and British Movement would stage “anti-IRA” marches as an excuse to attack and intimidate Irish immigrants. Meanwhile, first and second-generation Irish journalists have also spoken out about what is known in England as “Paddy-bashing” or “Catholic-bashing”. I love St Valentine’s Day. But with it comes sad memories, especially of the year 1976. In subsequent years there were other sad memories, such as hearing, just two days after the killing of Pat Finucane, about the assassination of Sinn Féin Councillor John Davey, with whom I had been interned. 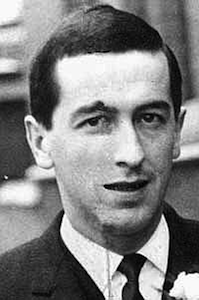 This had been Frank Stagg’s fourth hunger strike and he died in Wakefield Prison, blind, weighing four stones after sixty-two days, his wife and mother at his bedside. There were some protests on the streets, but not many, some rioting and some IRA operations. I was standing at the corner of Brighton Street that night with a friend, Seando Moore, when we heard a muffled explosion from the direction of Iveagh. About half an hour later we learnt that a small bomb had exploded in a house in Nansen Street and that our friend and comrade, Sean ‘Stu’ Bailey, was seriously injured, along with several young people. I wrote ‘young people’ there and it has just occurred to me that Stu himself was just eighteen. He had been in the IRA for over a year and had been very close to Paul Fox who had been killed on active service two months earlier. Stu had been shot and wounded by the Sticks in that disastrous feud of October 1975 and was still recovering. Days after the feud ended Stu, with his leg still in plaster from the gunshot wound, had gone to his brother-in-law’s wedding where the majority of the guests were Sticks! That night of the explosion I went around to tell his wife, Geraldine, that he had been seriously injured and taken to the Royal. On the mantelpiece was a Valentine’s card from Geraldine and their young daughter, Seaneen, which Stu was never to see. Geraldine and, I think, Stu’s mother, Mrs Bailey, rushed to the hospital where he died a few hours later. He was a very funny fellow with an infectious laugh and I can still see his spirit in his daughter. It is hard to believe that that was twenty-five years ago. But all of us, from whatever walk or persuasion, carry around inside us these evocative reminiscences, with the images and voices of our dead friends asserting themselves, and not just on anniversaries. Frank Stagg had made a will requesting that he be buried in the republican plot in Leigue Cemetery, Ballina, beside his comrade, Michael Gaughan. Before his remains were released, several other people lost their lives, including 17-year-old IRA Volunteer James O’Neill in North Belfast and 15-year-old Anthony Doherty on the Falls Road. As Frank Stagg’s body was being flown home, and as the aeroplane was approaching Dublin airport, the Fine Gael/Labour coalition government ordered Aer Lingus to fly on to Shannon were the special branch seized the coffin. To this day I can still see Frank Stagg’s mother standing at Dublin airport, completely bewildered, but absolutely dignified. The government had split the family, with one son, Emmet, who is now a Labour TD, sanctioning the hijacking. For six months the gardai were stationed in the cemetery watching the grave but eventually they gave up and left. And when they did, the IRA disinterred Frank Stagg’s remains and reburied them with Michael Gaughan, thus carrying out his last request. When you consider all the state and loyalist violence, all the laws, all the sermons, all the editorials, all the censorship, that were used to stop republicans from being republicans and practising republicanism, what is left is mountain after mountain after mountain of failure, and thousands upon thousands upon thousands of republicans who haven’t gone away and never will.